Get a jewel of a smile. Also known as caps, crowns are dental restorations surrounding a tooth that’s severely decayed, broken, or cracked. The purpose of a crown is to restore the tooth’s strength, function, and durability. 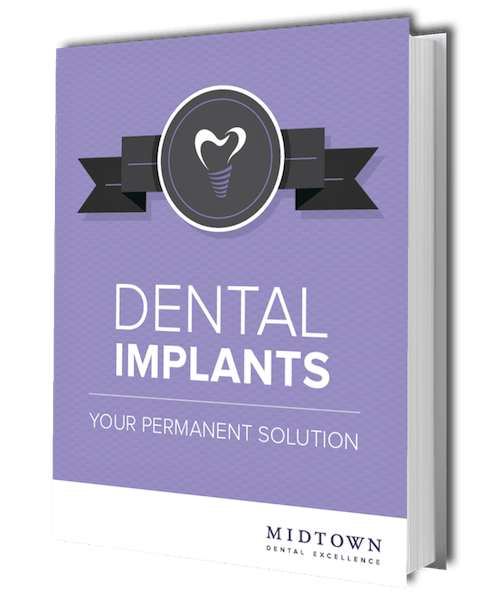 It can be used individually or for other procedures, such as bridges and dental implants. Preparation: To prepare a tooth crown placement, the area around the tooth is numbed, allowing us to easily shape the tooth to make room for the crown. We’ll use digital technology to ensure the new crown properly fits, functions accordingly, and the tooth color is carefully matched. Beautiful Fit: We’ll send our findings to our exquisite dental lab who’ll craft your gorgeous crown. Once it’s finished, our experts will place it over the natural tooth and make any needed adjustments. Strong and natural-looking restorations that bring many benefits to your smile. When a tooth loses its structure, dental crowns can help restore its shape. It can improve chewing function, speech, and esthetics. We’ll carefully match the shade of the crown to your natural teeth, so your new smile looks amazing. Digital Technology: Our dental experts at Midtown Dental Excellence carefully plan your crown’s design by using our innovative dental technology to analyze the shape, size, and fit. Our Trios Digital Scanner is incredible in comfortably and accurately getting the information we need to send to the dental lab. Expertise Care: All of our dentists at Midtown Dental Excellence have their unique specialties. Our combined knowledge with years of expertise allows you to gain access to high-quality dental care. Comprehensive Care: How will you know you need a crown? Our goal is to make sure you receive care that keeps your smile’s function and beauty in tip-top shape. When you come to see us for a checkup, we’ll do a thorough comprehensive exam to determine if you’re in need of a restoration. Have Questions About Dental Crowns? Get the answers straight from Midtown Dental Excellence! What materials are used to make dental crowns? During your comprehensive exam, we’ll discuss whether you’re a candidate for crowns and what material is the right option for you. With proper oral hygiene and regular visits to our dentists in New York, your crown can last between 15 and 20 years. Schedule your appointment with Midtown Dental Excellence today.